Today a man, tomorrow none. The text was translated by a man called Andrew Chertsey from the French – Art de bien vivre et de bien mourir – a fascinating medieval ‘how to’ on leading a good Christian life and thus ensuring the fate of your soul after your death. An illustration from the book shows a dying man surrounded by angels and demons. This book also has a very special provenance. 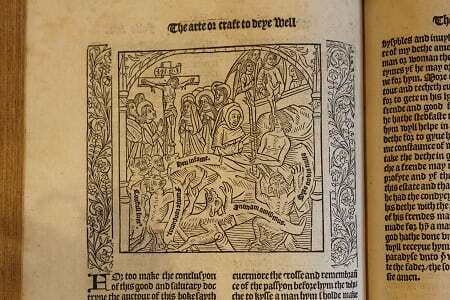 It is one of the texts that was produced in the early days of printing in London by Wynkyn de Worde, the lesser-known successor to William Caxton. Little is known about de Worde’s background, but it is conjectured that he first worked with Caxton during the latter’s years in Bruges, where he learnt the art of printing which he later brought back to London. Caxton is thought to have encouraged de Worde to join him in England in around 1476 to help him establish his business. At this time Caxton became the first man to introduce the moveable type printing press to England and from his business in Westminster he began to produce printed works, both in their original language and in English translations. After Caxton’s death in c.1492, de Worde took over his printing press and shop. De Worde made a great number of changes to the business in order to modernise it: he became less dependent upon wealthy patrons than Caxton had been, instead producing comparatively inexpensive books which could be sold to a wider audience and for them he printed a range of religious, popular and educational books. He changed the company’s paper supplier from a Dutch producer to John Tate, the first English papermaker. In 1500 de Worde moved the business from its original site in Westminster to new premises on Fleet Street in the City of London. His was the first publishing house to be established there, but many followed, and in later centuries the street’s name would be synonymous with the book and newspaper trade. In his career as owner of the press, de Worde published more than 400 titles in over 800 editions (in contrast to Caxton’s c.l08), for some of which only a single copy now survives. The quantities in which he printed encouraged the wider accessibility of written material, as did de Worde’s efforts to produce texts in English translations so they could be read and understood by those who were not sufficiently well educated to read works in Latin or any modern European language. The arrival of the printing press in England and the efforts of men like Caxton and de Worde vastly accelerated the spread of information to the public in a reliable medium. This led ultimately to revolutions in theology, politics and science across Europe in the following centuries. Previous PostPrevious A generous miser?